The party was a great success this year! The best yet, I would say. The weather was perfect and so was the company. I took pics of most of the tomatoes, and others took pics of the people. I have to work today so I don't have time to get mine ready to post yet, but I have the next couple days off so they will go up soon. I will post others' pics as I get them. There were 76 varieties to vote on. A few varieties showed up late so the total count was more like 90. Best Tasting ~ Indian Stripe, grown by Jerry P.
Tangiest~ ??? (a green mystery from a pkt. from Tomatofest) grown by Richard Price. Largest ~ Slankard's 2lbs. 1.9oz grown by Jerry P.
Prettiest ~ Green Zebra grown by Brenda F.
Thanks to all who came and made the party a great success! You know I realize now we forgot a group picture, oh well next year! Last edited by remy; September 6, 2009 at 05:42 PM. Actually, it was Indian Stripe, not Vintage Wine, that won Best Tasting Tomato! Jerry still has my camera, if he brings it back today, I'll ask him to give me his CF card and I'll do the editing & resizing and try to post the individual pics. Did you make a list of which varieties? I don't remember many duplicates but do remember there were 102 plates! Jerry just called, he will make a CD of the pics & get them to me in the next couple hours hopefully. Since I made a few "shopping" stops on the way home...even at that hour - God, I love 24 hour grocery stores....and what's a trip across the border without a stop at Tar-get?!? - I ended up pulling over for a wee nap on the way home. Think I got back closer to 3 am....at least the border crossing took less than 15 minutes at that hour. So I may go back to bed for more zzzzz's. Lots of great people - returnees and newbies too. Great to see that Jim and Galina made it - I wasn't sure if they'd get my pm with the directions in time, since it was posted in the wee hours on Saturday morning. Thanks for the seeds, Richard! Now I'm going to file last year's seeds into my main collection and will segregate this year's until next year's tomatofest....lol. Once again, my thanks goes to Remy and her family for their fabulous hospitality and all those that made this year's event what it was. Lots of great memories! I'll be back next year with bells on! KBHeart Pink 13N & 13S. Last edited by korney19; September 7, 2009 at 09:09 AM. I don't know why I wrote Vintage Wine! Must be the wine I was drinking last night . Anyway I fixed it. I did get pics of the back table, not sure if I got them all, but at least most of them. I also had a big brain fart yesterday! I forgot to thnk you for the excellent job on the certificates and awards as usual!! You know I appreciate it very much, the scale too! I'm glad you made it across the border yesterday, and that you made it home safe too! Hi guys, it sounds like you had a great tomato taste fest! I wish I could have been there with all of you and tasting all those fantastic tomatoes! I see I even missed out on that baklava! Darn! Now, what is taking you so long with posting the pictures? I HAVE 118 PICS, reduced from 194MB to 8.8MB. Most were around 4MB each, got most down to 60-70kb each. I also added Schwartz Sarah... If anybody has individual plated pics NOT posted below, please let me know so I can shrink/name/resize & add to the list. Without some of the missing pics, I can't make a complete varieties list yet! I believe we had 2 entries of Green Zebra, Giant Belgium (both appear to be "wrong" Tomato Grower's Supply "free" seeds I believe), Snow White, Tobolsk & Virginia Sweets. Any others please let me know. I also entered two versions of Gregori's Altai, the correct pink one, PLUS a red version I got from the late Chuck Wyatt in, I believe, 2000-2001. Alright, who put my Olive Hill in the Ugliest contest??? Last edited by korney19; September 7, 2009 at 10:45 PM. Reason: Added more pics! Thanks Robin! Here's everything else: the food, kids having fun, people, preparing the plates, the prizes and our mascot for the day, Korney's Sapphire Brandy Whine!!! Lots of varieties represented it looks like. And a big crowd! I think with the kids we had maybe 30-35 people. Yes, Saffy was spoiled rotten! If she wasn't chasing Korney's Jelly Beans up & down the sidewalk, the kids were giving her Milkbones & ice! 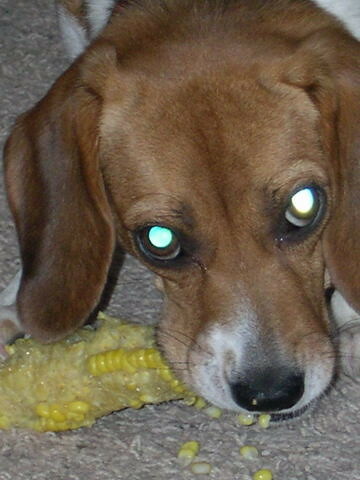 She loves tomatoes & corn on the cob, though she didn't figure out how to hold it yet! Here's the link to the photos I took. I'm still waiting on Sheryl for the people and awards pics. "Alright, who put my Olive Hill in the Ugliest contest???" I admit I did it, but it was at the suggestion of one of the people I didn't know. The growth stripes on top of it were ugly. There were definitely at least 30 adults there so with kids at least 40. Great to see you post from Norway! Sheryl told me to tell you she missed seeing you and the girls. That's a cute pic! Mark's dog is a cutie too.